True to their name, Vibe are all about spreading cool vibes with their recently launched hard coolers. Starting 2013, this cool new company came on the market with a serious commitment to making some of the coolest (pun intended) ice chests you can find anywhere. The founders, Joshua Thomas and John Ewald, are self-styled kayak addict and saltwater junkie, respectively. They also have a vibrant team that gives you a hpersonal feel while taking care to make the highest quality products you could expect. 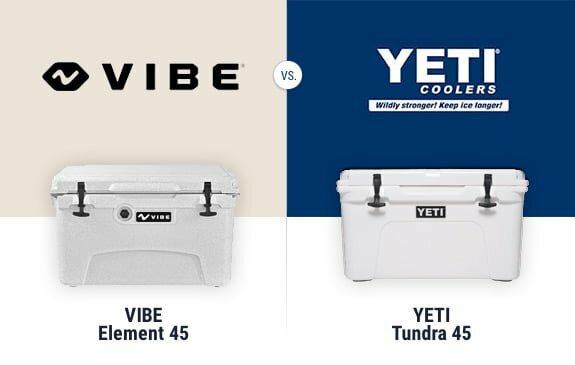 This vibe cooler review will be looking at these great products alongside great competitors such as Yeti, Milee, and niCE Coolers. In fact, there are rumors doing the rounds that Vibe coolers have a surprisingly similar design to other affordable, roto-molded coolers, such as the niCE or Milee coolers. But let’s not get ahead of ourselves, shall we? Vibe started out making kayaks. However, in 2013, they went ahead to make coolers for kayakers. If you’re a paddler, in particular, you’ll probably love the feeling of freedom that comes with the Vibe cooler. 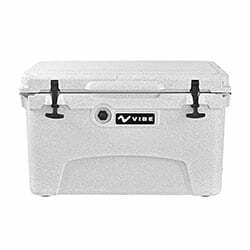 Whether you’re going for a simple paddle or a long adventure on the open waters, the Vibe ice chest certainly won’t let you down – it’s sturdy, keeps ice for long, it won’t break easily. So far so good: Vibe coolers are both feature packed, good looking and they come with affordable price tags. Let’s talk about specifics then. When it comes to construction, Vibe coolers are rotomolded. These things can keep your drinks cold for days on end. 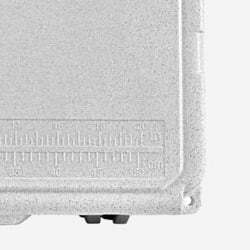 Roto-molded construction is actually quite common in high-end coolers. You’ll find it in everything from Yetis to Mammoths. Vibe Coolers incorporate roto mold construction in a right way. These guys didn’t set out to cut any corners with their designs. The rigidity of the walls is reminiscent of the kind of quality you’d expect from coolers such as Cordova and Orion. From the thickness to the durability, the team at Vibe put in a lot of attention to detail and it paid off in the form of a compact design with an aesthetically pleasing design. 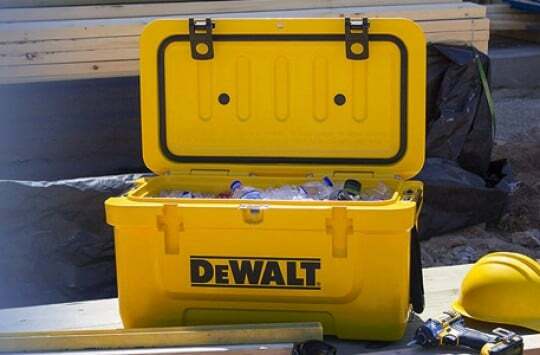 What do you think makes the ice chest so good at keeping things cold? The insulation, of course! While Mammoth and Cordova coolers boast 2-inch insulation, Vibe Coolers are in the corner confidently saying “yeah, keep talking” as they feature 3-inch insulation, although we think it might be slightly less near the corners (note: we’re going to update this post when we cut it in half to confirm this). 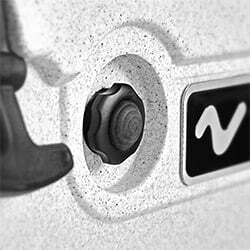 The walls of a Vibe cooler are capable of handling any of the shocks that come with an intense outdoor design. This is where the roto mold design shines right through and proves its mettle. As if that’s not enough, the walls come with cutting-edge UV protection. As you enjoy the wonderful features of your cooler, you can sit comfortably knowing that not even the elements can break them. The lid gasket also feels effective and durable. When combined with the T-latches, they keep all the warm air out from rushing in and compromising the temperature on the inside. This pretty clever airlock mechanism creates a separate environment on the inside that ensures your drinks stay cooler for longer. One of the problems you’ll have noticed with other coolers, such as the Orca, is the amount of work it takes to pry them open just to get a drink. This is all due to the suction created by the airtight design. Vibe solves this problem with a pressure release valve. This makes it especially easy to open it on warm days when the pressure gradient between the inside and the outside of the ice chest is especially steep. Your Vibe cooler could have been sitting snuggly in the sun, basking all day, and you still won’t need herculean strength to get to your drinks. Vibe Element Coolers go a step further and stand shoulder to shoulder with giants like Yeti when it comes to extra features. These are the features that aren’t meant to be main features but are appreciated all the same when we find them in a cooler. What am I talking about? Bottle openers, of course! All of Vibe’s Element coolers come with some helpful bottle openers on two opposite corners. This is a deliberate design. It means that, no matter what the orientation of the cooler is, you will be able to open your bottle easily. The bottle openers were thoughtfully made of metal to make them more versatile. They are also more than just bottle openers. You can use them to secure your cooler as lockdown points as well – just a tip. 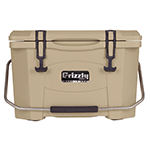 With a cooler that large and functional, you can expect some serious heft while carrying it. Any type of handle on this baby will need to be made specifically for the job. 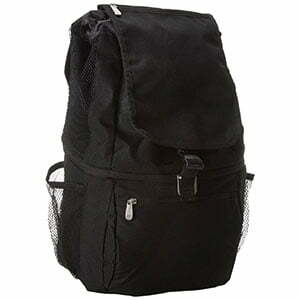 It needs to not only be strong enough for continuous use, but durable and comfortable as well. The larger coolers in the Vibe Element line of products feature straps made of nylon that have been wrapped in rubber for maximum comfort. This makes them very easy and convenient to carry around. The smaller Vibe Element cooler has a metal handle with foam wrapped around it (just like the Yeti Roadie). It’s much lighter than its counterparts and so a single metal handle is more than enough. The fact that Vibe coolers are made by a company that began by specializing in kayaks means that certain features are going to be unique to them and no one else. One such feature is the fish ruler you’ll find on all Vibe coolers. It makes life a lot easier for kayakers out there. Here again, Vibe’s biggest priority is convenience and they seem to deliver it without any difficulty. When you’ve had a swell time with your cooler in the great outdoors and finally want to clean it, you’ll find the job has been made particularly easy for you. 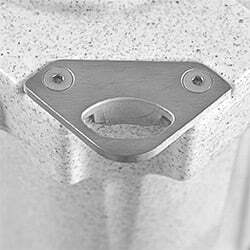 Each cooler features a drain spout that rapidly lets out all the melted water. It is also well secured with a chain to prevent it from getting lost. 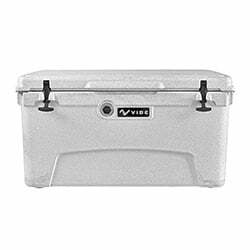 Speaking of sizes, the Vibe Element cooler comes in 3 sizes: These are the 20qt cooler, which is the smallest, the 45qt cooler, and the 75qt cooler. All of these sizes have two main color options: hunter camo and gray. 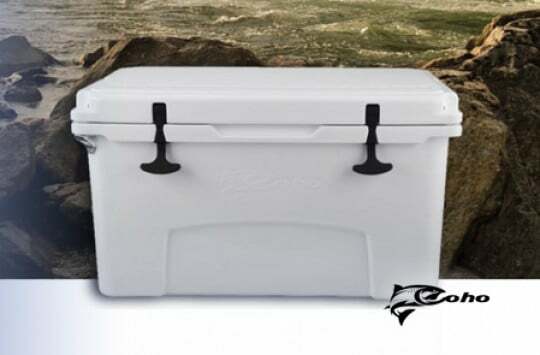 The Vibe Element 20 Cooler is a personal cooler with all the bells and whistles of the larger coolers but the convenience required by someone who doesn’t have a lot to put in their cooler. Weighing 14.4 lbs. and measuring 21.1 inches by 13.3 inches by 14.3 inches, it is most comparable to the Yeti Roadie. The Vibe Element 45 Cooler is in the medium range and is capable of handling some of the heavy duty demands of serious kayakers and adventurers. It weighs 23 lbs. and measures 26.7 inches by 16.6 inches by 16.3 inches. It is most comparable to the Yeti Tundra 45. The Vibe Element 75 Cooler is the largest offering by Vibe and can carry up to 59 cans of beer with a 50/50 beer to ice ratio. It is perfect for the most serious adventurers and kayakers out there. It weighs 32 lbs. and measures 33.5 inches by 18.2 inches by 17.9 inches. It is most comparable to the Yeti Tundra 75. 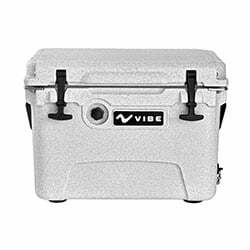 Vibe are quite remarkable in that they offer a lifetime warranty on their coolers. This is much better than what their competitors offer, which is typically a 3-year warranty. However, note that it is a limited lifetime warranty. Something to note here is that Vibe Coolers are actually manufactured in China. Of course, this doesn’t make them any lower quality than their competitors, but it’s probably going to be useful to know this for die hard supporters of “made in USA” products. On other hand, did you know that some YETIs are manufactured overseas as well? 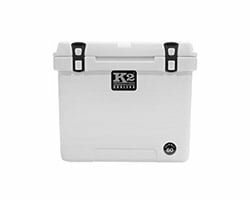 Yup, they are, so if you’re looking to buy an ice chest from a brand that 100% makes their products here in the US, then we’d recommend checking out other brands, such as the Orca or Grizzly coolers – but keep in mind that it’s going to cost you more. If you don’t mind where your cooler is manufactured, as long as the quality is great, then Vibe Element coolers should be perfect for you. 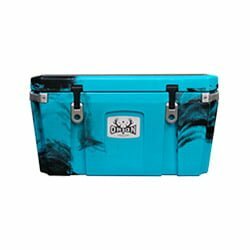 They come at a fraction of Yeti’s coolers’ prices and offer very decent quality. 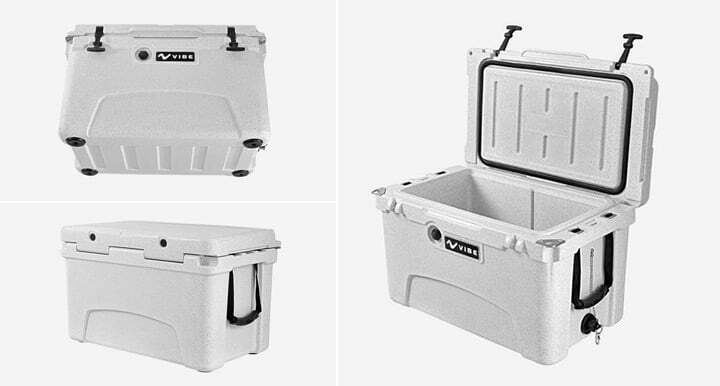 The best comparisons we can make are with the Yeti Tundra / Yeti Roadie, which excellent-quality premium coolers that everyone’s talking about. 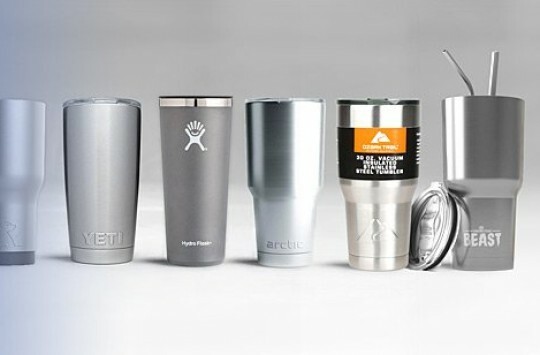 In this case, Yeti is already well known in the market, being a pioneer in the market for high end coolers. Vibe, on the other hand, is a fairly recent player in this market. Vibe certainly has some extra features that you won’t find on a Yeti, such as the fish ruler and the double bottle openers. However, Yeti still proves superior in terms of ice chest size. Both share most of the other features, such the air-tight gasket, and the pressure release valve. If you’re looking for something that is pocket-friendly while still offering good quality, you certainly won’t go wrong with a Vibe Element cooler. They have some great features that are bound to make adventuring more convenient for you. However, be prepared to face some restrictions in terms of size options. Vibe only offers 3 sizes which are most comparable to the Yeti Roadie and the Yeti Tundra. If, on the other hand, you’re looking for the tried and true, then the Yeti is your choice. You’ll be paying extra, but you’ll be avoiding the risk of trying out something new. Vibe Coolers can be bought on their official site here or on Amazon. If you want to get a bargain, your best bet should be Amazon. Here you will not only get plenty of price options in a trustworthy market, but you’ll also be able to read plenty of customer reviews and make an informed judgment for yourself. This Vibe cooler review should tell you everything you need to know before making your first purchase of a Vibe Element cooler. If you want to be different and try out something new, as opposed to already popular Yeti, then we can assure you the Vibe isn’t going to disappoint. Before you decide though, you may want to compare Vibe to other brands offering roto-molded ice chests within the similar price range, such as the Milee, Pure, Driftsun and the niCE, to name a few. As for Vibe, as long as one of their limited size options fulfills your needs, for this price we think this cooler is definitely worth trying out. Bird Dog Coolers Review - Your New Outdoor Best Friend?